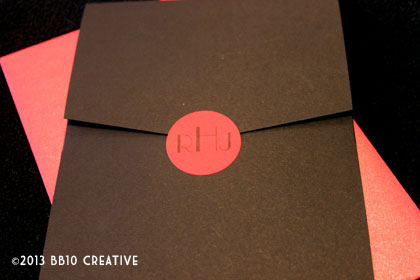 Up next in the 2011 wedding season is a very cool vintage black and red wedding invitation. Rachel and Jacob’s wedding date is right around the corner in early October, however we started our process way back in September of 2010. 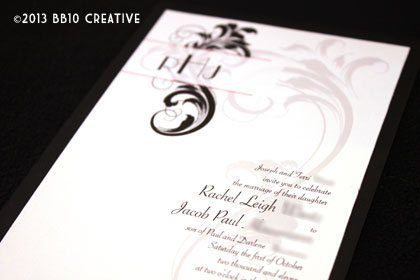 Rachel came to BB10 Creative looking for fun, traditional and simple invitations with a vintage flair that would incorporate her wedding colors of black and red. 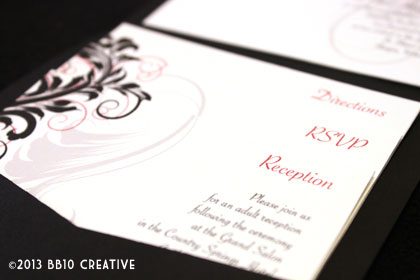 The resulting invitation uses a formal black and red embellishment designed with the look of an engraved mark on the paper. The couples’ monogram is highlighted in an art deco style font and is paired with a very 20’s style script font throughout. The invitation is housed in a black matte vertical pocket enclosure, with the embellishment spilling over the cards in the pocket. The invitation was sealed with a coordinating red sticker with the monogram and was mailed in a very classy red metallic envelope. These really stand out in the mail! 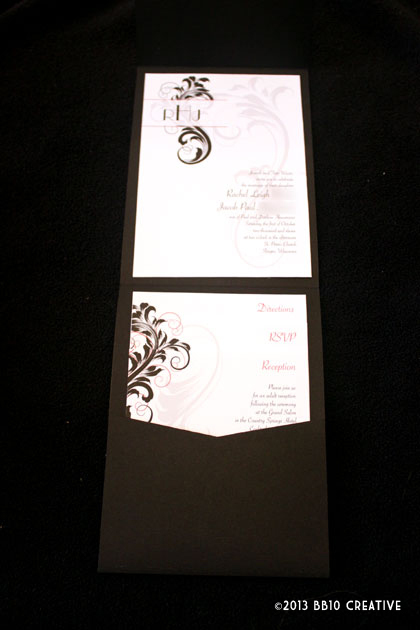 The invitation itself was printed on a clean white linen cardstock, adding to the vintage feel. I love the final product on these invitations, and all of the coordinating materials for the wedding follow through on the vintage theme. Full designs will be posted soon on BB10 Creative! Also stay tuned for some site changes coming up on BB10 Creative – we’ll be highlighting our invitations in way that will be much easier to browse through! Check back on the blog soon for another 2011 wedding post, we have three left to feature for the year. 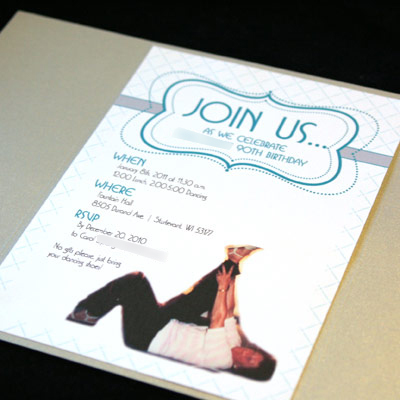 Custom Birthday Party Invitations: Kick up Your Heels at 90 Years Old! As I’ve mentioned before, from time to time we stray from our regular business of wedding invitations and stationery and take on other fun graphic design jobs like custom birthday party invitations, shower invitations, graduation announcements, birth announcements, etc. Recently I was asked to create a fun and unique invitation for a 90th birthday party. 90 years is definitely something to be celebrated! And this special lady is doing it in style with a big party that includes a polka band. I hope if I make it to 90, I can also send out 100 invitations to my closest friends for a big dance party! Since the party is in January, we decided on a “winter” color scheme of silver and teal. I incorporated the colors using a silver metallic sheet as an enclosure and teal ink for the designs that complimented the teal envelope. One request from the client was to use a cute picture of her grandma “kicking up her heels.” And thus the theme of the invitation was born! I created a gate fold invitation and used a silhouette of grandma for the outside, on a sticker that holds the two flaps (gates) together. Once opened, the picture is revealed with a fun art deco type of invitation design. 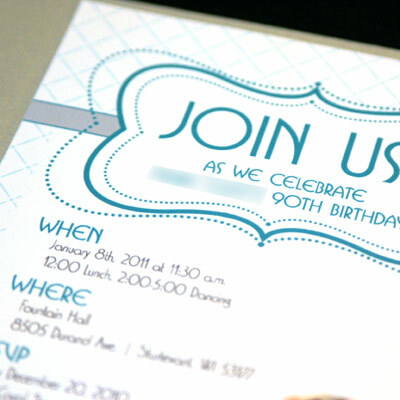 Overall it is a cute and fun invitation design for a very fun 90 year old. Check back soon for holiday card designs as well as save the dates coming up for some 2011 weddings!